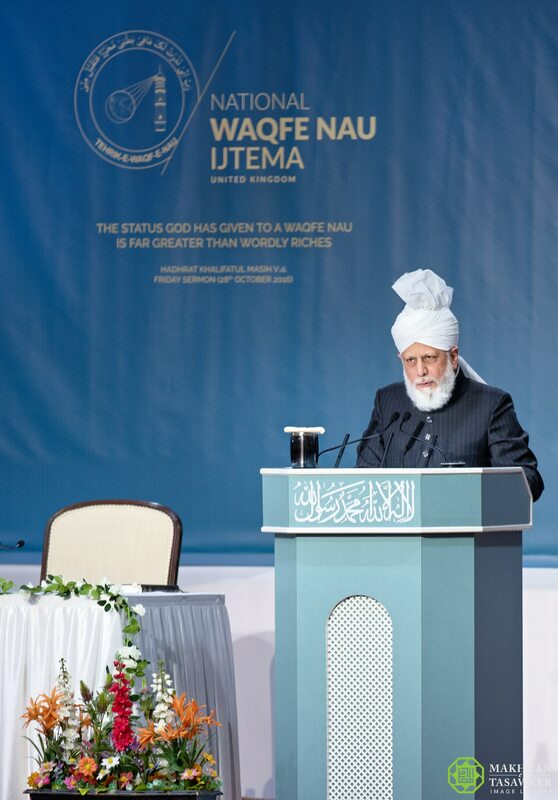 On 06 April 2019, the World Head of the Ahmadiyya Muslim Community, the Fifth Khalifa (Caliph), His Holiness, Hazrat Mirza Masroor Ahmad addressed the concluding session of the UK National Waqfat-e-Nau Ijtema (gathering), an event held for female members of the Ahmadiyya Muslim Community in the UK who have pledged their lives for the peaceful service of Islam. The event took place at the Baitul Futuh Mosque in London and was attended by more than 1100 women and girls. In his address, His Holiness explained that in today’s society, attacks against Islam, through false allegations and criticisms, were extremely prevalent. In light of this, His Holiness reminded Ahmadi Muslim women in attendance that they must never feel any embarrassment or inferiority complex regarding their faith. He urged them to stand up with certainty and conviction to respond to those who seek to defame Islam. His Holiness also directed Ahmadi Muslim women to set the highest standards in practicing the teachings of Islam, so that its values remain firmly instilled in future generations. He warned those Ahmadis who do not remain attached to their faith that their own lives will be squandered and their future generations will be lost to the materialistic world. His Holiness began his address by reminding those in attendance that, although they have grown up in Western society, they are distinct from their counterparts because their parents, prior to their birth, dedicated their future lives for the sake of their faith. As such, they must constantly strive to learn and act upon the teachings of Islam. His Holiness proceeded to explain that the Holy Qur’an contains universal, comprehensive, and relevant teachings which provide the answer to every charge or accusation made against Islam. As such, Ahmadi Muslim women must read and understand the perfect teachings that Allah the Almighty has bestowed upon us in the blessed shape of the Holy Quran. His Holiness directed members of the Waqf-e-Nau scheme to read the books of the Promised Messiah (peace be upon him) in order to understand the Holy Qur’an’s meanings and to defend Islam. His Holiness said that Ahmadi Muslim girls should remain proud of their faith and never fall prey to the belief that Islam was not relevant or in touch with modern society. His Holiness advised Ahmadi Muslim women to take pride in their faith and never hold “any form of inferiority complex” about their faith. 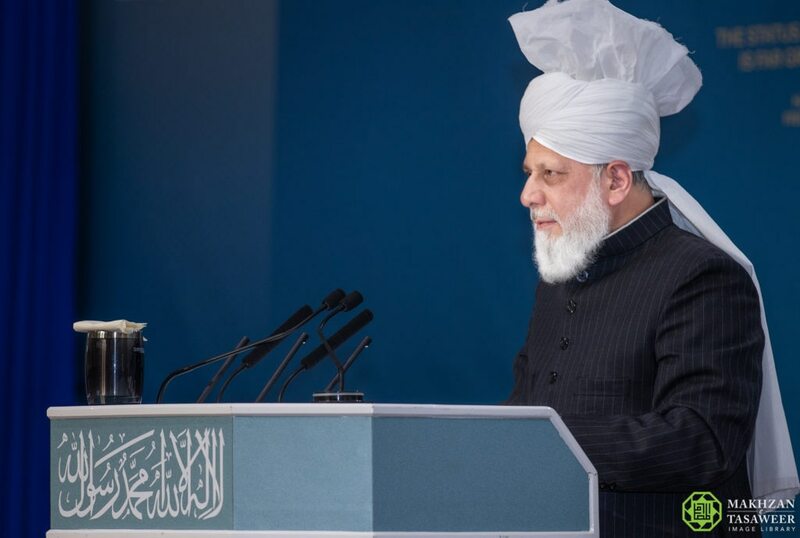 His Holiness noted that some young Ahmadi Muslims, particularly teenagers “feel humiliated and rejected” due to the ridicule they witness of their religious beliefs in the wider society. Analysing the state of Western society, His Holiness highlighted that most people have lost their true religious identity and of those who still identify as Christians, many are not following its teachings. As an example of the moral decay associated with a separation from God, His Holiness pointed towards the breakdown of the family system. His Holiness said it has become normalised for children to disrespect their parents, all in the name of ‘freedom’ and ‘independence’, thus threatening the family unit. Increasingly, His Holiness said, children are being taken into care homes or local authorities and police are being called to resolve domestic issues. His Holiness also said that many women who are members of the Waqf-e-Nau scheme are now mothers themselves and so they must set a personal example of piety for their children to follow and learn from. His Holiness said that if mothers do not play their vital role, then Mosques too will “become empty and hollow shells” just as the places of worship of other faiths. However, His Holiness said that this will not be the case with the Mosques of the Ahmadiyya Muslim Community because it is the Promise of Allah the Almighty that Islam will remain a living religion and it is for this purpose that the Ahmadiyya Muslim Community was established by the Promised Messiah (peace be upon him), to revive the true peaceful message of Islam. The event concluded with a silent prayer led by His Holiness.